At Northern Beaches Neurology, we pride ourselves on performing thorough and precise neurophysiological studies, and our team brings extensive expertise and experience. Fast-tracked test appointments are available for urgent problems. See below for information about each test and how to prepare for the test. Your doctor may suggest that you have nerve conduction studies performed. These tests measure nerve signals and are used to look for evidence of nerve damage. During a nerve conduction study electrodes are placed over the skin. A small electrical impulse is applied to a nerve and the electrode measures the response. These tests are not harmful, but you may experience some discomfort, like a brief shock of static electricity that you may feel when touching a metal railing. In many situations, EMG may be needed following nerve conduction studies to give more detailed information about damage to muscles and nerves. EMG involves placing a very fine needle under the skin, which acts as a microphone to record the electrical activity of the muscle. The size of the needle is similar to an acupuncture needle, and usually produces only mild discomfort. *Please inform the staff if you are taking blood thinners such as warfarin prior to this test. Nerve conduction studies +/- EMG takes around 45-60 minutes to perform. We ask that you do not apply skin lotion or moisturiser prior to your test appointment as this can interfere with the recordings. Northern Beaches Neurology was the first private neurology practice in Australia to routinely use ultrasound for the diagnosis of nerve and muscle disorders. Dr Simon is the leading Australian expert on neurological applications of nerve and muscle ultrasound and he has published widely on the topic. Ultrasound is harmless and painless and provides excellent detail of nerve and muscle structures. It provides valuable information on the structure of nerve and muscle and is complementary to the results of nerve conduction studies and EMG. Ultrasound may be able to identify the precise cause and location of nerve or muscle injury. Ultrasound is also useful to guide treatments such as nerve or muscle injections, as it can visualise the needle so that the injection is placed accurately. 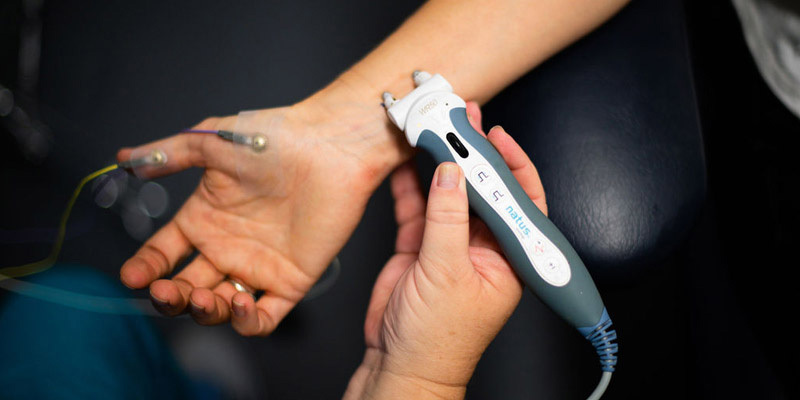 Ultrasound testing is most useful when nerve conduction studies and EMG have not found the cause for the symptoms, when nerve injury is progressing rapidly or when atypical features are present. It is also useful for those patients who are unable to tolerate nerve conduction studies. EEG studies involve placing a series of electrodes on the scalp to record brain electrical activity. Your doctor may request an EEG if you have had a seizure, blackout, dizzy spell or ‘funny turn’, or are experiencing confusion or memory changes. An EEG takes approximately 40-60 minutes to perform. Wash your hair the night before or the day of the test, but don't use any conditioners, hair creams, sprays or styling gels. Avoid anything with caffeine, such as coffee, tea, cola or energy drinks six hours before the test. Take your usual medications unless instructed otherwise. If you're supposed to sleep during your EEG test, you may be asked to sleep less or even avoid sleep entirely the night before your EEG. Evoked potentials may be ordered to test the pathways in the brain and spinal cord. Evoked potentials involve placing discs over the scalp, which record the electrical activity from the brain. A stimulus is then given to the nerves in the arm or leg (somatosensory evoked potentials), the eye (visual evoked potentials), or the ear (brainstem auditory evoked potentials). SSEPs are used to test the passage of signals in the spinal cord and brain. Your doctor might order SSEPs if you have possible nerve or spinal cord damage. SSEPs are performed by giving recurring low-intensity electrical stimulation to a nerve in the wrist or ankle. Electrical activity is recorded over various points of the limbs, spine and scalp and these signals are used to determine if there are any points of damage along the pathway. SSEPs are not painful, and take 60-90 minutes to perform. VEPs are used to test the visual pathways between the eyes and the brain. Your doctor might order VEPs if you have experienced a change in your vision. During VEPs, you will be asked to look at a screen displaying a flashing checkerboard pattern. This activates the visual pathway and signals are recorded from discs on the scalp at the back of the head. It is important that you wear your glasses or contact lenses for the test. The test requires some concentration to remain focused on the screen, but it is painless. VEPs take approximately 60 minutes to perform. BAEPs are used to test the pathways between the inner ear and brain. Your doctor might order BAEPs if there has been a change in your hearing ability. During BAEPs, you will wear earphones that produce a series of clicking noises. Series of sounds are repeated to produce signals that travel through the acoustic nerve and brain, which are recorded by discs placed over the scalp. BAEPs are painless and take about 30 minutes to perform.